The pieces I’m gluing back together form parts of the ilia – the long bladelike parts of the pelvis. The brush and glue bottle above give you an idea of the size of the jacket. 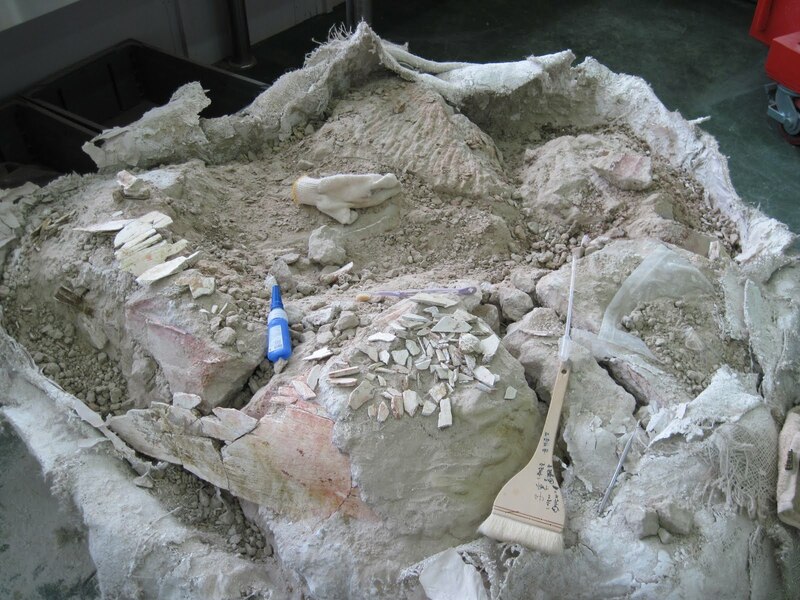 And the size of the bone bits. I took this photo shortly before my eyes crossed and I gave up for the day – this will be an ongoing project for slow times over the next few weeks. 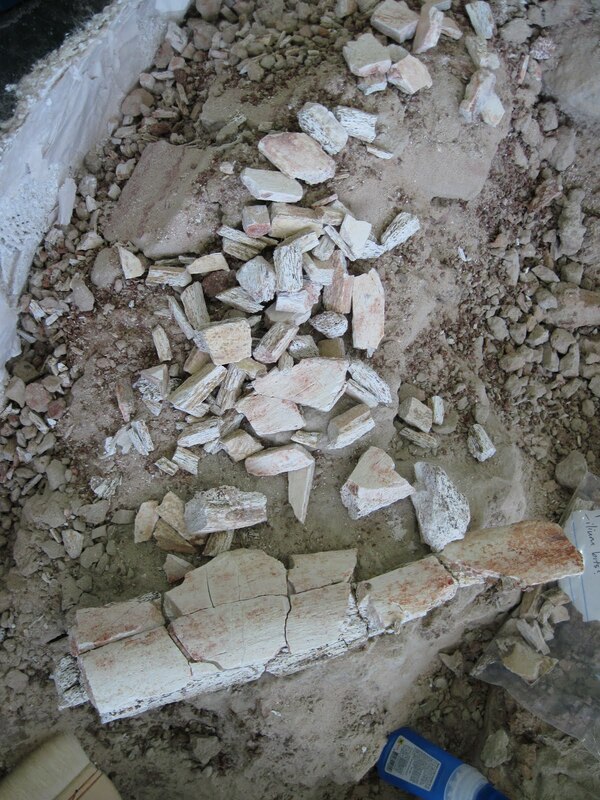 The main parts of the bones have been stabilized so now I can continue removing loose rubble. A few people have asked me what the outside of the lab and visitor centre looks like, so here you go. The public part of the building is located in the round section at the front – the ground level has displays and posters, and the upper level has the small theatre and patio. As an aside, I caught a bit of the movie that they show in the theatre – a pretty nice computer animation that tells the story of Protoceratops and how the eggs and nests were preserved. The prep lab is found in the section behind the public area, the big flat glass windows under the looming dinosaur. Behind that is unprepared storage on the ground floor, and offices and collections on the second floor. ← Starting in on the skeleton. I like puzzles! Unfortunately, I am not very good at them. 😦 Yours is looking great, though! P.S. mmmmm … dog halves. The building looks like quite the modern structure. Having a dinosaur lurking on the roof is great! Dogs are meant as pets and cut in half as a stew!! Poor little “doggie”! 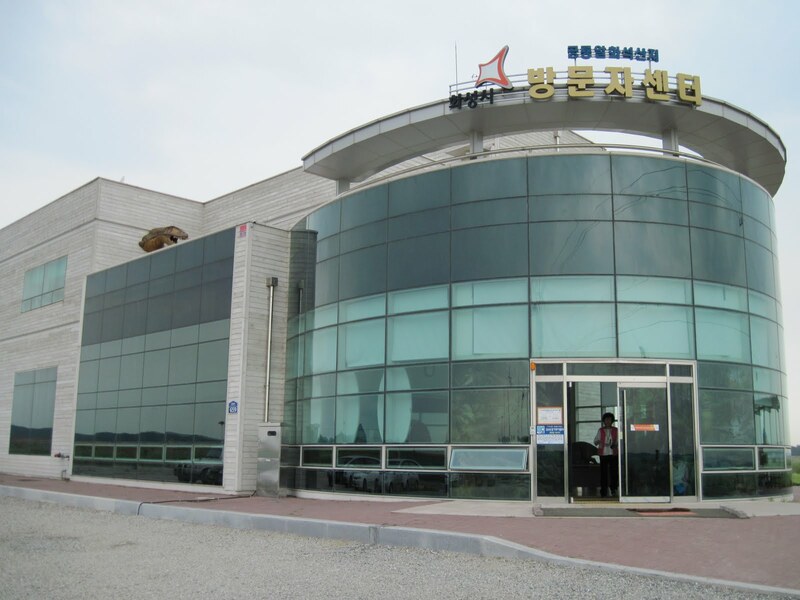 The museum is called “Dinosaur Egg Fossil Visitor Centre” (Kongyong al hwason sanji bangmunchasent'o, in Korean).